Winter is here. When the snow falls, the back breaking work of clearing it is never far behind. It doesn’t have to be that way however. 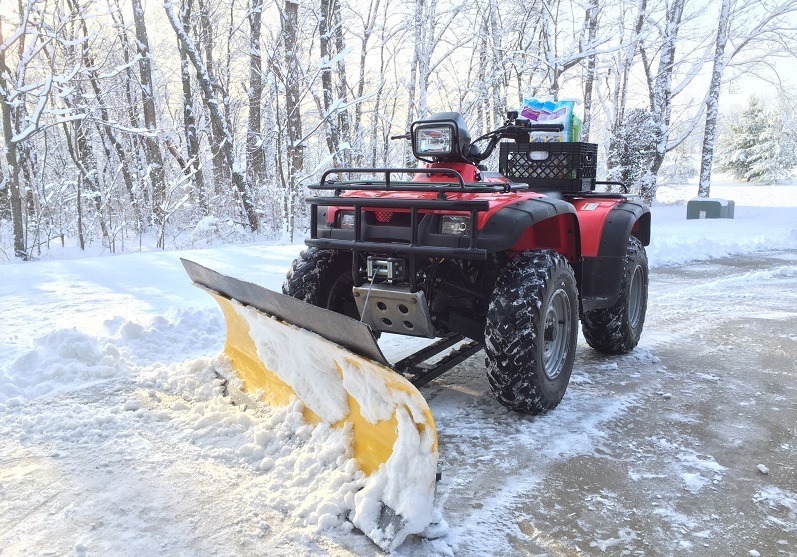 With ATV snow plow kit, you can attach a plow to your all-terrain vehicle and clear your driveway and sidewalk in no time at all. So what is the best ATV snow plow on the market in 2018? We have taken an in depth look and brought together 5 top rated ATV plow systems. For our results at a glance, check out the table below. For a dedicated buyer’s guide plus full reviews of each of our picks, keep on reading. The principle behind how the ATV (or UTV) snow plow works is quite simple. The kits available contain a plow that is attached to the front of your vehicle. Some ATV plows will have lift systems which are powered by your machine. This enables you to efficiently dispose of the snow in piles where you please. Other, more budget friendly models will not have this option. Instead, you use your vehicle and plow to push the snow away in order to clear the surface. Blade width is the most important consideration and should be decided upon early on. The fact is the type and size of ATV or UTV you have can help determine the snow plow kit you should buy. If you own a larger sized UTV with a width of 60 inches across or more, we recommend purchasing a snow blade between 60 and 70 inches. For more standard sized ATVs (no larger than 50 inches in width or above 500cc) the more common 50 to 55 inch model ATV snow plow should do the trick. The size consideration is blade height. Most blades range from 16 to 24 inches high. Basic physics apply here. The fact is, short blades have less surface area so do not require as much power to push. This means if you have a lower cc ATV you should opt for a short blade plow. On the other hand, more powerful ATV or UTVs have the capacity to cope with the extra snow load you get with a taller blade. Take a moment to look at the weight specification when buying your atv plow. Again, the power and size of your vehicle is relevant. If you have a lower cc ATV, you should not buy the heaviest plow on the market. Common sense should be applied here. The weight of the plow you buy should not put undue strain on the motor or suspension of your ATV. The two main designs of ATV snow plow are the straight or v-shape. Straight plows are more common and are generally the cheaper and lighter too. V-plows benefit with having an arrowhead design. This enables the plow to slice through frozen snow more efficiently. Stacking snow is also easier with the V-plow due to the shape and onboard features that the kits provide. They are more expensive and are better suited to larger ATV and UTVs however. The most common approaches are lifts one and two. These are sufficient methods or the home user, however having the benefit of using the ATV winch is recommended. For those clearing on a more commercial scale, (public parks etc) a direct lift system would be the preferred approach. If you need to plow on a commercial scale, it’s well worth looking into a direct lift hydraulic system. Here the kit snow plow has the inbuilt capacity to lift up and down, meaning you can remain comfortably seated on the ATV as the plow does the work for you. Further ATV specifications that should be considered before you buy the best ATV plow system for your needs, are tire size and tread. Your tires should be in good condition to provide the traction required to plow the snow. It can be difficult to determine the best ATV tires for plowing, however an aggressive the tread pattern in terms of size and depth will help stop those wheels from slipping and sliding. Our top pick best ATP snow plow is the Extreme Max, UniPlow One-Box all in one kit. Whereas some brands expect you to purchase the blade and mounts separately (along with other accessories to make everything work as it should), the Uniplow has everything you need upon arrival. Within the kit you have the plow blade, a universal mount, (as you will see, the plow is compatible with a wide range of ATP sizes) and push tube assembly. For the purposes of this review we will take a close look at the 50 inch blade version. The one piece steel blade plow comes in a 50 inches wide and 16 inches high. With the added benefit of 3/16” grade 50 gusseting, you end up with the girth you need to move that stubborn snow. The Uniplow also comes with a 2-sided, 3/16” steel wear bar attached. This attached to the main unit with grade 8 bolts and heavy-duty adjustable skid pads. The end result is extra durability and a more efficient snow plow function. Another great feature is the ability to select multiple blade angles. The easy adjustments system works by moving the pin and angling the blade into one of 6 preset positions. The Uni-Mount Universal Mount connects to the frame of your ATV behind the wheels. This allows for better user control as the configuration directs plowing force through to the ATV frame. The result is smoother, more effective plowing. As we stated above, the unit fits many types of ATV with the universal mount able to connect with square, round and Polaris Sportsman frames. (However, Extreme Max recommend that you consult the fit chart for complete compatibility details. If in doubt you can always contact them direct too). The ingenious UniPlow welded push Tube design allows for fast and easy installation. For increased durability the plow has a black powder coat finish. This is also aesthetically pleasing. To top it all off, the UniPlow One Box ATV Plow is fully made in the USA and comes complete with a 1-Year Warranty. Some minor user complaints about poor installation instructions. The UniPlow One Box Snow Plow from Extreme Max gets our top pick because it has the convenience of an all in one ATV plowing solution, while still being packed with great features and robust design principles. If you want to get the work done quickly and efficiently and at a price that won’t break the bank, in our opinion this is the best ATV plow to buy. From the all in one kit of the UniPlow, we now turn to industry heavy weights WARN, and their component approach. The plow that we have selected from them to make our top 5 list is the WARN ProVantage ATV 50 inch plow. (Other sizes are available depending on the ATV you own). WARN have excellent reputation in the ATV snow plow arena and in many ways are seen as a premium brand. Designed from the ground up with a priority towards durability and high-performance, buying a plow system from WARN is certainly an investment. On the downside however is the fact you will need to buy the components separately before you have a complete working system. With that issue in the back of our minds, let’s take a closer look at their Pro Vantage 50 inch plow. (Should your needs be different the Amazon product page does provide the option for a range of plow sizes. See our buyer’s guide for more information on selecting the correct size. For compatibility questions you can also contact WARN direct). First off is the sheer thickness of these things. Constructed from 12 gauge steel complete with reinforcing ribs the blade is certainly deigned to last. Furthermore WARN have added a center cross member with boxed design to ensure that no area of the blade suffers from weak points/. WARN have opted for a center-mount configuration on their ProVantage systems. Not only does this add extra stability to the ATV while the plow is in operation, the fitting is also designed to generate high ground clearance. Ideal snow clearing over demanding terrain and with high curbs and steps. The plows are built with a large diameter pivot assembly. This enables a smooth and precise rotation of the blade that like the rest of the construction is designed with long lasting service in mind. The blade is covered in a low-friction powder-coated finish which helps prevent snow from sticking to the plow. So lots of really good design features in the plow. However, do bare in mind that to have a fully working system you will need to purchase the base and mounting kit – both of which are sold separately to the blade plow. The blade is just one component – Base and mounting kit both have to be purchased separately. There is no denying that the WARN 78950 ProVantage straight Plow Blade is a well made tool. If you are going to be doing lots of snow plowing with your ATV and have the budget to purchase all the components that make up the ProVantage system – you will not be disappointed with the premium performance you’ll obtain. However, if you want an all in one solution upon purchase, our number pick UniPlow is the better option for you. Another all in one solution makes our list. This time its the 10-0520 X Factor Plow in a Box from Kolpin. So how does it compare to our number one choice UniPlow? Not bad at all in fact. Kolpin have opted for a forward mounted frame on the X Factor. With this configuration the plow does have sufficiently high floor clearance and overall blade lift. A double layer of steel has been used on the blades construction. The X steel stamped design provides greater robustness through the center of the plow. The base and mounting components incorporate a heavy-duty 3-piece steel and tube frame. While not up there with the likes of the ProVantage in terms of impact durability, this does tolerate the plowing conditions of the average user, however some customers have complained that the construction does not do a good job of withstanding unintended bumps. The universal forward mount attaches to the ATV frame via u-bolts or clamps and will comfortably fit most ATV models from 2002 onwards. And of course being an all in one box solution, the Kolpin 10-0520 X Factor Plow has everything you need upon purchase. No welding is required, just bolts (clamps) and easy to follow instructions. Some customers have complained about the plow’s weak construction that does not withstand bumps. A minority of users have experienced the unit arriving damaged or with missing pieces. Overall the Kolpin 10-0520 X Factor Plow in a Box is a good option ATV plow for those that want a convenient and affordable ATV plow solution. However, it does lose out to the UNIPlow on a couple of design aspects and features and is not as robust as other plows in our list. Now we turn to the daddy plow of our top 5 list. The Denali UTV snow plow system comes in at a extremely large 72 inches. Being an all one kit, everything you need to connect the system to your UTV is provided. While a number of brands are supported, (see tab below), it is still advised that you contact Moto Alliance direct should you have any questions regarding compatibility. You should also consider the fact that the inclusion of the 2 inch receiver mount, means the system works with UTVs (or mini trucks for that matter) with a 2″ receiver hitch installed. The 72 inch blade is constructed using 11 gauge steel. A design feature that helps enable such a large blade from maintaining consistent strength throughout are the four, 7 gauge ribs that run the full height of the plow. Furthermore, the addition of 3 horizontal stabilizers help support the deepest recess of the blade; the bottom line being you have a plow able to sustain high impact force and weight of heavy duty UTV application. The entire system has been designed with an “Easy-Connect” principle in mind. Created by Moto Alliance engineers the kit can be disconnected from the frame of the UTV with great speed and efficiency. Comes with 2 inch receiver mount to work with UTV winch. More expensive than the other plows in our top 5 list (this size is for UTV use however). The 72 inch DENALI UTV Snow Plow System is a formidable piece of kit. If you need an all in one system to combat deep snow with your UTV, this is the system to buy. Highly recommended. The final entry in our top 5 best ATV snow plow review round up is the Swisher 2645R 50-Inch Universal ATV Plow Blade. Like the WARN blade reviewed above, the 2645R requires additional components in order to function. In this case before you can begin to plow using your ATV you will need to purchase the Swisher universal mounting kit. With that advice out of the way, let’s take a closer look at the blade. This 50 inch plow blade is made from a 1/8-inch corrugated steel construction and features heavy-duty swivel with dual engagement. The blade also has a heavy-duty cutting edge (reversible and replaceable to extend work life) and skid shoes. It is also capable of being adjusted to multiple angles. An added bonus is the fact this can easily be adjusted from the seated position. No unnecessary jumping on and off your ATV to change the settings. Furthermore, the inbuilt dual-locking angle position holds the plow fast where ever you select it. The lift height clearance is good (you have between 18 and 24 inches to play with – depending on ATV bike and tire size). The plow blade can also be used with an existing winch to power the up and down movement. Like all good ATV snow plows, Swisher have designed the blade so that it can attached and detached from the main unit in seconds, without the need for extra tools. User instructions have been cited as poor. The Swisher 2645R Universal ATV Plow Blade is a versatile tool with some good features, Build quality is also adequate. However, we would recommend the WARN system over this.